Well, if there’s all this Grace afoot, where’s all the Discouragement coming from? Is it just local? Probably not. Let’s have a look. When we look closely at the Mercury Kite, we see that it gets more complex. As the first map in Grace and Discouragement Pictures shows us, there are Squares to each of the upper corners of the Kite, which creates a Finger of Yod pointing at the base of the Kite, Neptune. That shifts the entire emphasis of the Kite from Mercury to Neptune. Probably a good bit of advice for any astrologer – don’t lead with the “good news”! So instead of lots of Communication and intellectual Clarity here, we can expect Confusion. Of course Confusion is the first stage of Growth in Consciousness, but that only works if we can avoid making decisions that refreeze our Consciousness into some Dualistic box. A “Brilliant” is a Kite, with a Yod pointing at the bottom of the Kite, shifting the focus from the planet at the top of the Kite to the planet at the Bottom. The Squares are Venus-Jupiter to Ceres-Vesta, and Juno to Pallas. What do they tell us? The difficulties here may revolve around Realigning our Values (that which we always respond to Emotionally) with our Sense of what’s Sacred and what isn’t (that which outrages us as true Blasphemy). We got much of both from our Karma and our Programming, and to the extent that these Consciously or Unconsciously conflict with our True Feelings, we’re likely to be experiencing dissonance. How do we know our True Feelings? Well, our True Feelings may cause quite a bit of dissonance with our family, friends, roles, and jobs, but they don’t cause any dissonance for us internally. We are at Peace with ourself. Which doesn’t mean that there won’t be many brutal catfights as our Karma, our Programming (which is often, though not always, aligned with our Karma), and our True Feelings fight one another to the death as they try to exert control over our Ego. Then there’s Boundaries. For instance, my neighbors – even the adults – feel compelled to throw footballs, basketballs, beachballs, soccerballs, frisbees, and all manner of other mobile sports apparati, and the shoes that chase them, into my garden, where they can do literally years’ worth of damage, if they knock over a slow-growing plant like my Evergreen Huckleberries, or knock the blossoms off the second Elderberry tree that’s necessary to pollinate the first one. They have no idea what they’re doing. To them “food” comes from the freezer cabinet at the supermarket and the microwave. Why should anything in my yard be any more fragile than a blade of grass, especially when for the moment you’ve transformed into Michael Jordan or Richard Sherman or Mario Götze. Even if you knew or cared, what’s the Value of that plant compared to the glory of the perfect shot or block or kick. But it triggers my need to Defend my Boundaries, and Conflicts mightily with my “Don’t-Rock-the-Boat” Programming. What’s the resolution here? Well, the focus is on Neptune, the planet of We-Are-All-One. So would the easiest resolution be to roll over and let the neighbors walk all over my garden and me in their pursuit of self-aggrandizing sports glory? That may be valid, but it’s probably a little extreme – a recommendation that I PIAVA a solution that meets everyone’s needs may be more appropriate. Planting those thornbushes (nasty Blackcaps that’ll rip your clothes right off of you if you get too close) around the perimeter immediately jumps to mind, but then, I’m not Changing the Subject, am I. Both Squares make Tricolors with Neptune, advising us to give it over and let a Higher Power deal with our Boundary and Value-Sacred Conflicts. That’s a lot different than a Mercury focus, though soon we’d like to post some intersting observations about the Second Harmonic. We need to change the Patterns in how our Discouragement interacts with our Yintegrity. Yintegrity recall means our ability and willingness to act from the Soul rather than from the Social Contract. Good time to run that four-part review of our Manifestation processes that we described in the August Blessing Highlights post. Do we Believe it’s possible to have Yintegrity and Community both? Do we Deserve to have both Community and Yintegrity? Do we Know What It Feels Like to have both Yintegrity and Community? Are we willing to Try It On? What about the Lilith-Saturn Square at the base? Specifically, these Pattern Changes are what we’re likely to stumble into if we Focus on our Yindependence and let our Curiosity take it from there. Our Yindependence is our willingness and ability to Live our own Life, rather than letting others tell us what to do. So, what would be a Feel-Good way to educate the neighbors to keep their errant and other disharmonious projectiles out of my garden? I’d have to patiently explain to them what they’re doing and why it doesn’t work in my yard. They have a lot to learn, so it will take repetition. But of course first I’ve had to Tap Out as much as I can of my own dissonance over hating to have to speak out, self-hate over abrogating someone else’s Yindependence by giving them Limits, and Frustration over having to have to explain myself, not to mention the historical/Karmic Abandonment and compensatory Anger that arises for me around it all. Thank Goodness that Grace dominates here! I’d be without a paddle otherwise. The Seventh Harmonic is symbolized by the Charioteer, or Stillness and Action – Energy applied at the right moment, without waste or counterproductive harassment. Sort of the opposite of the way the United States of Thag has used its primary export (violence) since at least 2001. The Brits are starting to think about whether bullying is the appropriate answer for every insult, but it’s less likely that the UST will come around, since every Congressional district relies on those exports for jobs, and if they aren’t used in Syria, then where? I think of the Seventh Harmonic as Shamanic, because knowing when to Act, and when not, is a subtle but critically important element of Power. There’s a compelling Configuration in the sky, in place from around 10am PDT August 29, to about 9am PDT September 3, where Pallas, Uranus, and Saturn form what for lack of a better word I’m going to call a Septangle. Saturn makes a Triseptile to Uranus, while Pallas sits at the far Midpoint Biseptiling both of them. The Triseptile is three sevenths of the way round the loop, while the Biseptile is two sevenths of the way. The result is a fat Triangle, a little off center but otherwise looking quite like a Grand Trine or T-Square. It’s not symmetrical, but neither is Shamanic Energy. Of course we know that Saturn making any Angle to Uranus is a request of some type to Focus on Who You Really Are. If Obomba can find a way to punish Assodd without killing and maiming a lot more mostly-innocent people, maybe it will signify a turning point for Who the US Really Believes Itself to Be. And Pallas is the Goddess of War, so her involvement is particularly keen here. As we often say, Mars shoots first and asks questions later, while Pallas asks questions first and shoots only if necessary. We think of Pallas as symbolizing Boundaries, and these really are Boundary issues, notwithstanding all of the “line in the sand” metaphors. The Waning Triseptile is about pollination, occurring as it does between the Bloom (Opposition) and the Fruit (Phitile). 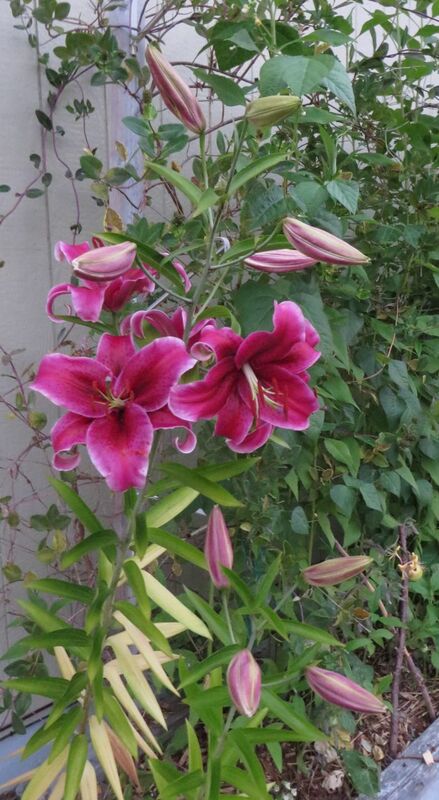 Without properly-timed pollination, you can have lovely Flowers, but you won’t get Fruit. Will the Thags in the UST stand up and say no, we don’t want another War? This Saturn-Uranus Cycle is one of many that were born during the Harmonic Convergence, in February 1988, “The Pope blessing the faithful” (30 Sagittarius). The Blooming was in November 2008, as Obomba was elected. The Waxing Square, when the Pope’s Blessing would “become permanent,” occurred in July 1999, and was a part of the 1/1/2000 Grand Cross that brought us the extreme Polarization that we’ve been seeing since. July 1999 gave us the Woodstock 1999 disaster that made Altamont look like your third-grade birthday party. Some people say that Altamont “ended” the 1960s. The essence of the 60s was Vulnerability – and the Exploitation of Vulnerability. Experience with the Vulnerability part is essential for anyone to align with their Soul (Uranus). And a crude first reading of Pluto (the Pluto-Uranus Ouija-Board Initiation characterized the 60s) would make the Exploitation part sound appropriate. The Transformation of Vulnerability would be a more meaningful reading. While the 60s may have ended at Altamont for concert fans, it certainly didn’t end for everyone else. Now that we’re at the Waxing Uranus-Pluto Square, it’s clear that setting Boundaries to make Vulnerability safe is important in any Fear-based scenario, and there is a deep connection between Fear and Exploitation. 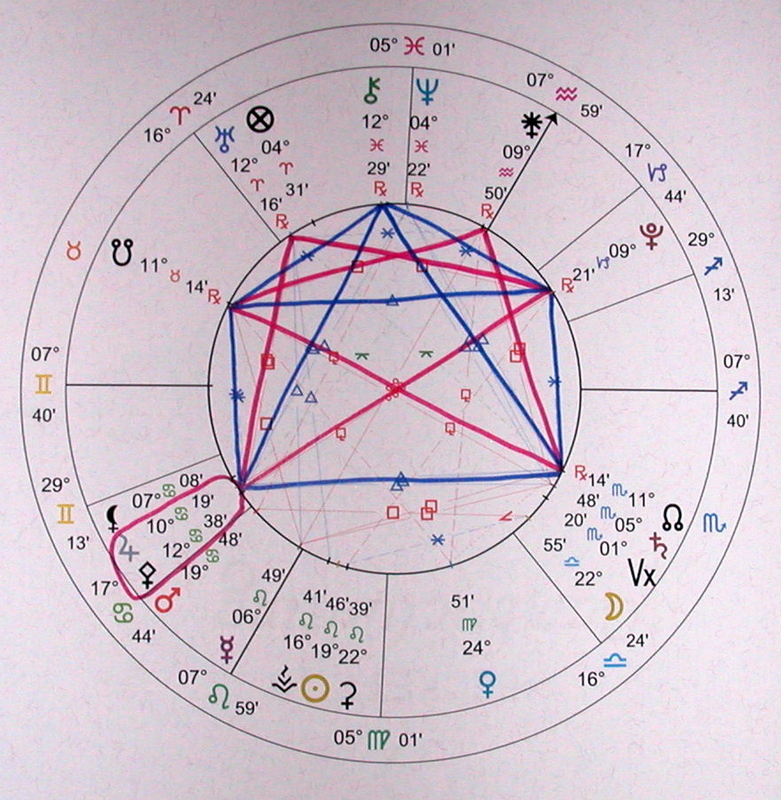 Pallas (Boundaries) and the Moon (Authenticity) were the other two members of the 1/1/2000 Grand Cross. Now the Moon comes around to join Pallas at the apex of the Septangle at half past 5am PDT on September 1. It will be within the two-degree Orb usually used for the Seventh Harmonic, for about eight hours centered on that time, the first four hours being probably more potent. Pallas and the Moon sit at 25 Cancer, “A will-full man is overshadowed by a descent of superior power.” Intense. So the 1/1/2000 Grand Cross, certainly the largest if not the deepest Configuration of the Century’s birth chart (Chiron-Pluto and Neptune-South Node would be deeper), is this weekend folded into a Moon-Pallas-Saturn-Uranus Septangle. That certainly makes this weekend a critical turning point for the evolution of the Century. Will Obomba, with a premeditated attack on an ally of Russia-China-Iran, within earshot of a nuclear-armed Israel, start WWIII this weekend? It’s the easiest way out of his ongoing economic dilemma. Or will the Bees of Sympathy and Understanding, Harmony and Grace Abounding come to our rescue and pollinate a different kind of Fruit? We are Graced with a complete Grand Sextile. The Sun has moved in to replace Mercury in position #6, and will stay there until September 4. The Sun represents Essence or Source, and it joins the Nodes (Destiny and Choice), Pluto (Transformation), Chiron (Miracles), and Lilith (Collaboration) in the Grand Sextile. Surely that will help. The Sextile is a Human-Goddess Collaboration, though, and Human Effort is required to Initiate Grace, lest we wallow in Fate, Ego Death, Despair, and Abandonment instead. So it may be a good time to let your Voice be heard for Peace, and to devote the four hours prior to 5am PDT September 1 to PIAVAs for Peace. 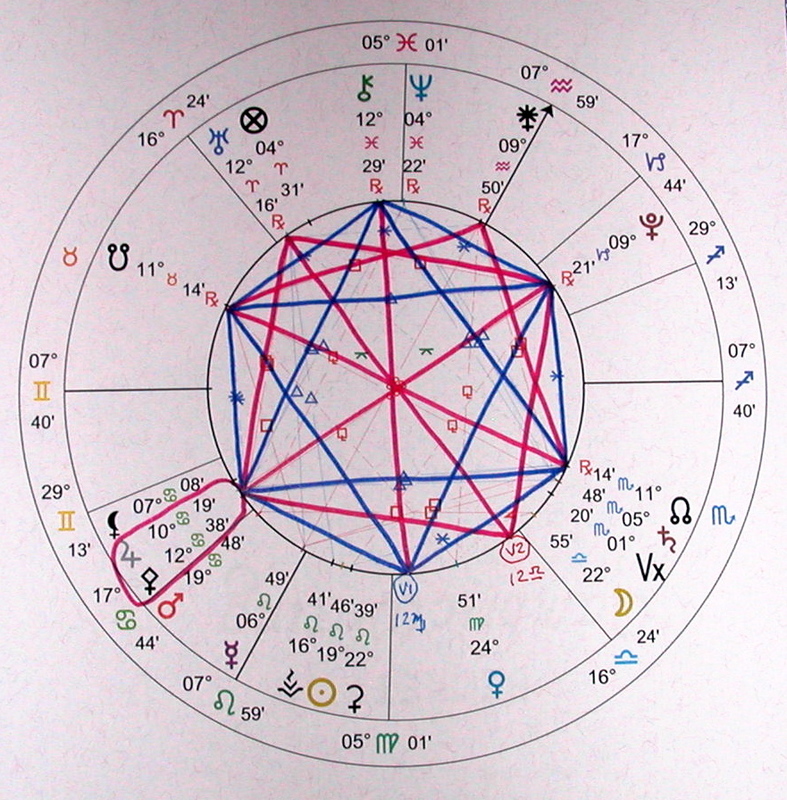 The dashed lines on the horoscope picture are more Seventh-Harmonic Angles. Mercury Septiles both Saturn and Pallas from their Midpoint, while it Triseptiles Uranus. Mercury is about Communication and Awareness, signifying that it’s an even more important moment (remember the Septile is about how Power interacts with Time) to Speak Out, and an important Portal for Epiphanies. The Moon is frequently the Trigger for Manifestation. It certainly indicates that Power is Afoot! It’s a Balsamic Moon, symbolizing Endings. Pallas, and the Moon when it’s there (and during the 8-12 hours prior to that), makes a Waxing Square to Eris (Exposing Denial) – all the more impetus to Speak Out. Eris Initiated Pallas back in March at 22 Aries, “The gate to the garden of all fulfilled desires.” If you desire Peace more than War, the next few days would be an excellent time to say so. Mercury is moving into the Vacancy in the Grand Sextile. Using three degrees of Sensitivity, Mercury completes the Grace from about 7am PDT August 27 till about 10pm PDT August 29. What’ll this do for us? First, a Sextile is about “Creative Grace” – the Universe will smile on your projects once you get them started with your own Initiative. 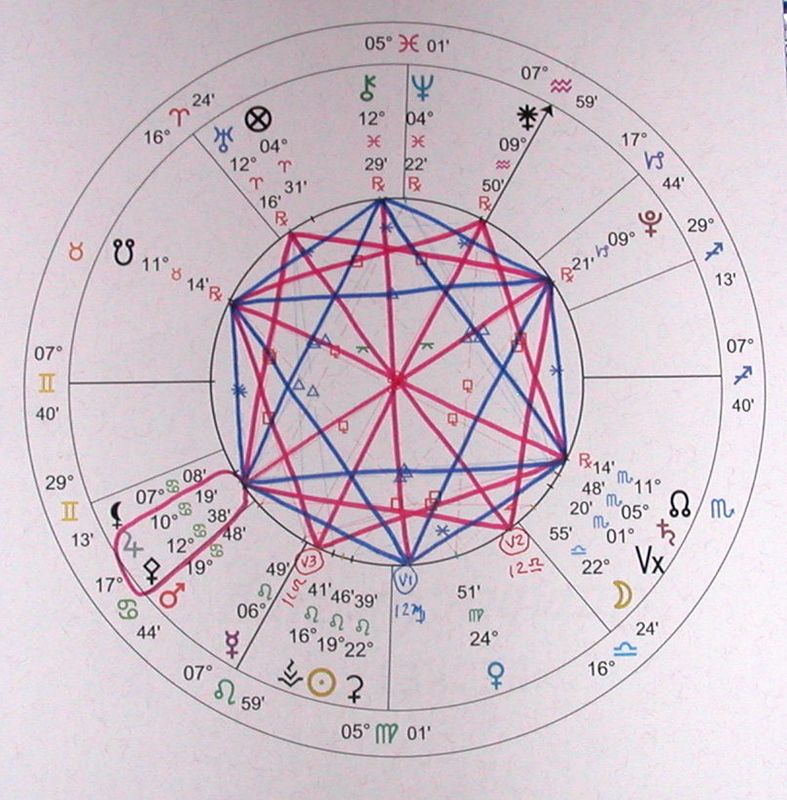 A Grand Sextile is six of them end to end, so they make a hexagram circling the whole Zodiac. It’s Creative Grace Galore! The Sextile is a Sixth-Harmonic Angle, and the Sixth Harmonic is about Partnership, so our collaborative projects are particularly favored. When you draw a hexagram and then connect all the points to one another, you get two Grand Trines superimposed into a Star of Dave, and three Mystic Rectangles. A Grand Trine is three Trines connected end to end, making a Triangle with equal sides and angles, and it symbolizes Glorious Grace – so much Grace that there’s a grave danger is hubris! The Third Harmonic is about Love with Wisdom. The Mystic Rectangle is a box with Trines on two opposite sides, connected by Sextiles. We get the Grace of the Trines and the Creative Potential of the Sextiles, without the hubris. Mercury represents Communication, Awareness, Divination, Commerce, Travel, Interaction across the Veil, and the Trickster Coyote. Mercury is quintessentially mental – hence the Trickster subtext, because mentality with its reductive Either/Or fixation, is perpetually believing in Illusions. Of course the Spiritual Function of those Illusions is to show us the Coin, to give us the opportunity to move out of Either/Or into Both/And. Who else is in the party? Mercury’s joining both Nodes, Pluto, Chiron, and Lilith in the Grand Sextile (Eris wasn’t invited). The Nodes stand for our Path in the Lifetime, from our Habitual Patterns and Limiting Beliefs enforced by ancient Emotional Holding but also hiding untapped Skills in their vaults (Karma, the South Node) to the Deep Desires and Unquenchable Wants that guide us into our Limitless Future (Mission, the North Node). Turns out the South Node’s Hidden Skills are necessary if we are to achieve the North Node’s Deep Desires. But the Nodes are anchored deeply into the Unconscious, and as such they frequently flip; always best to avoid getting stuck in Either/Or when dealing with our Karma and Mission. Pluto, the Great River, the Force of History, the Illusion of Linear Time, Change, Transformation, Trance Formation, the Deep Unconscious, and Ego Death. Pluto represents (for this Planet) the Universal Trance, the Illusion that almost everyone buys into. Not wise to fight Pluto. Steer from one side of the River to the other to avoid the Rapids, but don’t try to swim upstream. Great Power if you align your journey with the River’s. Pluto can be transcended, but not usually successfully. Chiron – Fundamentalism (believing one’s metaphors) and Reframing (finding new perspectives), Healing (the Emotional equivalent of Reframing), Despair, Miracles, Breaking Patterns and Habits, Transcending Karma, and New Paradigms. The Twelfth Harmonic, or the Hanging Man, hanging by his heels to see the World differently. Chiron tells us when to cut the chords and start over. Lilith symbolizes Pre-Intellectual Instinct, Non-Judgment, Yin Energy, Collaboration, Cooperation, Community Orientation, Continuity, the “Flow” that carries us effortlessly forward. As Pi and Eris bring the Planet back into Balance, Lilith is on the Rise. Doing Astrology is like creating a Menu – choose one item from each of the major Food Groups, and try to combine them harmoniously. So for example we might start with Grace following Effort (Grand Sextile), add a pinch of Awareness (Mercury), a tablespoon of Desire (North Node), a cup of Limitation (South Node), an openness to Ego Death (Pluto), a willingness to solicit Collaborators (Lilith) to help you lovingly embrace Despair (Chiron), mix well, and bake for half an hour. Let’s say you’re feeling Limitation in some area of your Life. You could increase your Awareness of the Despair you feel about that, share your Dreams and Frustrations with close friends, and tell your Guides that you’re willing to give up a few less-than-essential comforts if doing so will move you a step or two closer to What You Want. You don’t want any great leaps, because your Upper Limits would push you back, and you’d end up Manifesting your Fears. You want to move toward your Dreams in small steps, lovingly, gently, rapidly, and completely. You also want to Intend that you gain all of the benefits that you would have gained by doing it the hard way, while doing it the easy way. Now, there are seven elements here – the Grand Sextile and its six members. And we’ve listed between four and nine keywords and key concepts for each element. That means there are almost half a million ways to combine these keywords into a story, and that’s using only the keywords I’ve listed – as you get to know the actors you find that there a lots of other key words and concepts that can be associated with each actor. Creative Grace; Communication; Emotional Holding; Desire; Transformation; Fundamentalism, Non-Judgment… By focusing on the places in us that some part of us considers to be blasphemous or life-and-death dangerous (Fundamentalism) and setting up Non-Judgmental Communication between (1) the way those places make us feel (Emotional Holding) and (2) the way we’re going to feel when we achieve our Desires – maybe by setting up two chairs facing each other, deeply feeling one of those feeling complexes while sitting in each chair, and then having a conversation between the two parts of ourselves, Grace will help us Transform what feels stuck. Effort to Initiate; Commerce; Limiting Beliefs; Unquenchable Wants; Ego Death; Miracles; Collaboration… You really want Abundance, but your Limiting Beliefs hold you back. It feels like you will Die if you transgress those Beliefs, but maybe if you Collaborate with a Partner you could Initiate a successful Business. No, no, that can’t happen, you don’t Believe it, do you. Well, what if it could? 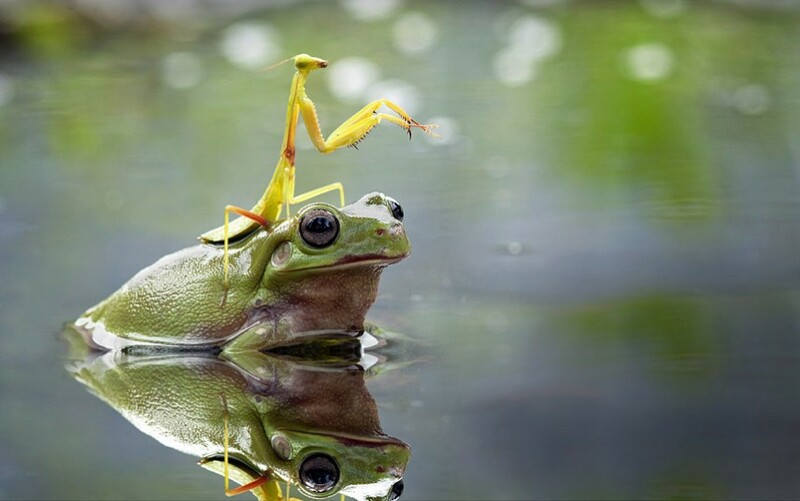 Can you start a dialog between those two, the Inner Believer and the Inner Non-Believer, and see if they can negotiate a compromise? Potential; Coyote; Hidden Skills; Limitlessness; the Force of History; Despair; Instinct… It’s tricky business, trying to open up to the Skills that hide beneath my difficult and forbidden Emotions. I’d be a great teacher, but I’m too shy to do it. I know those Skills are there, I just don’t ever get them validated by anyone else, so I think I’m deluding myself, and that Depresses me. I don’t like to think about it. Maybe if I found a place that really needs what I could offer, and volunteered as a teacher’s aide for a while, I could get some practice and start gently challenging my Limits. You see, there are half a million ways to experience a Grand Sextile, and that’s only using the parameters we’ve described. I’m sure you could invent a thousand different stories for each of the three keyword combinations above – that’d give us half a billion. Then recast each story using different pronouns, and see how different I-stories feel from you-stories. You can see how everyone experiences the World differently, and how self-sabotaging are our Judgments of them for experiencing it differently than we do! Those Judgments Limit our willingness and ability to Collaborate, reducing the fruits of our labors exponentially. Thank the Goddess that Lilith is on the Rise, as it’s obvious that Cooperation is the only answer to the difficulties facing us. I know, our Frustrated Inner Heros will have to endure what feels like Death to understand that it’s about the Team, not the Leader. Eris, now, is Trined by Vesta. So it’s a good time to be forthcoming about what’s really bottom-line important to you. Not trying to convince anyone else that they should do it your way, but just so you have it out in the open, so you can be Known. It’s important to Community. 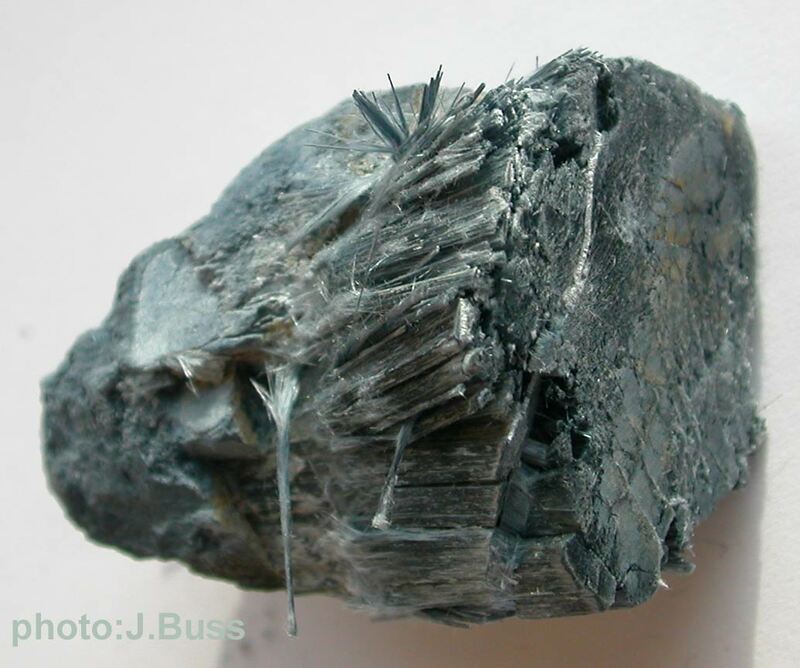 Kongsbergite is a natural form of the Mercury-Silver Amalgam that dentists used to cram into your teeth before you realized that Mercury is highly toxic and made them stop. The metal Mercury creates Confusion; isn’t that contradictory to the mentality that Mercury represents astrologically? We’re programmed to believe that Confusion occurs when ideas seem to conflict, but true Confusion occurs when ideas seem to concur, because then we believe the ideas, and not the complex Reality beneath them. We end up glued to the photograph and unaware, blissfully or otherwise, of what’s being photographed. The Karma of Western Civilization lies in these Fundamentalist Patterns. Much attention is focused on the battles between different religions and their conflicting Worldviews. 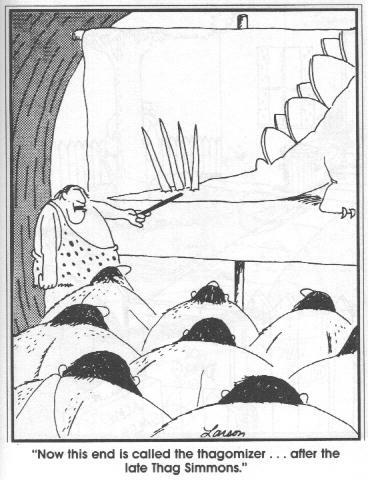 But Scientists are just as Fundamentalist, believing their metaphors often more passionately than religionists, and dismissing other Worldviews as primitive superstition. Capitalists and Colonialists are even more destructive, believing that their metaphor of superiority over other people and other species gives them the right to take more than others. It’s the failure to realize that mentality is a small part of the Universe, rather than the other way around, that Limits the Future of the Western Empires. “In the Beginning was the Word” is the ultimate intellectualist blasphemy. In the Beginning (and thus ultimately underlying All) was and is the Vibration – the Energy. Yes, you can see that as Sound, since Sound is one scale of Vibration. But to diminish Sound into Word just demonstrates how illiterate the Western Worldview becomes in its focus on anthropocentric Intellect. Not that we aren’t all, in one way or another, Capitalists, Colonialists, and Fundamentalists. As Gandhi says, we need to Be the Change we wish to see in the World. That’s pronounced Yer’-en-us, just so’s there’s no confusion. Sounds like “you’re in us.” She’s gorgeous, isn’t she? Notice that she’s tipped 90 degrees, so her polar axis is parallel to her orbit, not perpendicular to it like all of the other planets. 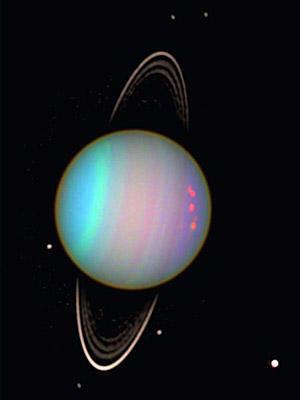 Not particularly into Conformity, that Uranus. She’s like one of those people that are so rich that they don’t care what you think of them. Did you know she wears Rings? So there’s an indication of heightened Intuition as well. Lilith being slower (ie, more profound) than Jupiter, we’d normally assign the Cat role to Lilith. But since the Mouse hasn’t been eaten yet, we see that the Cat must be on the defensive. Jupiter’s the first social planet, so what if we cast Jupiter in the role of the traditional Culture, and Lilith (Feminine Instinct) in the role of the underpuppy. That would certainly match the historical narrative. And the current trend, where the traditional Culture is defensively backpeddling like crazy trying to keep a rising Feminine under its thumb. A Jupiter-Pluto Cycle would be about Accelerating Transformation and I’m not sure why, but every time I run across this image it feels like the drama is about to break wide open. Maybe because the lad is overweight and thus out of tune with the lawn order implied. The Moon’s Waning Square to Jupiter-Lilith would be short-term. Remarkable how tuned in to the Cosmos Bill has been every week. Bear in mind that what is repressed into the Unconscious actually runs the show; it’s just that the Conscious Ego in its Denial doesn’t notice the Pattern. So it’s quite the Cosmic Joke really. The implication is Do what you want – it doesn’t really matter because it’s all gonna work out just fine. Meanwhile Comet ISON is Opposing Juno, completing the Grand Cross with the Nodes, and resurrecting our fun adventures with our own self-sabotage Patterns. We’ve been working on this for awhile – what, since May? Are you making progress? Or still shooting yourself in the foot? You don’t know? Well, what if you did know? Except for the Vacancies, we still have a hobbled Grand Sextile for another couple of days, till Mercury moves into position #6 on August 27, followed by the Sun on August 31. So that leaves us with only one Grand Trine, Jupiter/Lilith to Chiron to North Node. This is incredibly beneficent, because it includes a corner of each Grand Cross, making enormous Grace flow between the two! Getting Aware of the ways we sabotage ourselves, and Recognizing the cultural transformations that are going on, when taken together, exponentially accelerate one another. The result? – What’s the third planet in the Grand Trine? Chiron? Isn’t that Miracles? Since we’re talking about the Unconscious, Heads are Tails and Tails are Heads – you have to focus on the Coin. These planets are about Disruption (Uranus), Confusion (Neptune), Deconstruction (Pluto), and Despair about all that (Chiron) – and as well about Integrity (Uranus), Clarity (Neptune), TranceFormation (Pluto), and Miracles (Chiron). It’s easy to say that you get the first set of characteristics when you look through Material Eyes (Matter), and the second set when you look through Spiritual Eyes (Energy), and in general, that’s a very useful metaphor. Dances of these planets can Disrupt whatever is out of Integrity in your Life, Confuse you wherever your priorities and motives are Unclear, Deconstruct any old Trances that are obsolete and in need of Reformation, and signal you that it’s time to chuck it all and start over, by dumping you into Despair. We all run around in Trance, all of the time, so don’t try to kid yourself about being immune. And while you’re at it, don’t forget that Confusion is the first stage of Growth! By now we’ve gotten ample information about what’s out of integrity in our Lives. The hardest things to recognize are the most important, and the most central to our Lives, closest to our Essence. So if you’re still suffering, that’s good, it means you’re onto some really really Core Issues. You just have to remember that we’re talking way way up above the plane where the Ego operates – if the Unconscious was a Satellite, the Ego would be a Kite. Yes, a Kite all dolled up to look smashing! Only with the right angle, good weather, and a glint from the Sun, would we ever even see the Unconscious. It is very possible to work with the Unconscious, but there are rules. As Ursula would put it, Rules Change in the Reaches. And how true that is! First, there is no Cause and Effect – that’s an artifact of Linear Time, which is a mass Trance. Time ended, remember? We just haven’t changed all of our Patterns to adjust yet. Second, of course no Either/Or or Contradiction. That happens in the mechanical mind, which doesn’t even go up to the Kite level, more like the Hip Pocket level – the Ego’s way smarter than the mechanical mind, at least it knows how to keep us alive. The Unconscious is totally and completely Both/And. The Third Rule is that you don’t petition the Unconscious to preserve or create any particular Realities, you kneel before it and humbly Ask it to share its plans with you, . It’ll replace you with a Walk-In in a minute if you get too uppity – don’t think it hasn’t happened before! Not that the Unconscious is nasty – that’s Freudian Old-Testament Firebreather Trash, er, I mean Trance, that some of your ancestors got stuck on and never could figure out how to break out of. I think they liked the illusions of Power and Order. If you’re trapped in one of those, just pray for a Rapture so you can start over cleanly. There’s NOTHING that the Unconscious loves more than your commitment to cooperate with it!! It has plans that are going to happen anyway, and it’s a lot easier to ride shotgun than to try to fight for the steering wheel or cower in the back seat. It needs Trust, and that’s about Faith, and that’s going be your major contribution. Sure, you’ll be chipping in for the gas, but you won’t even notice that. While Uranus represents the most personal region of the Unconscious, even there, personal doesn’t mean anything like your Ego imagines (such as Wow, I’m really special! or Hoo, am I a piece of sheet!). It just means that the Uranus region of the Unconscious is more about your own Soul Chord than anyone else’s. Of course, your Twigmates aren’t far off, but they have their own Twigs. Not at all a lonely place, it’s permeated with all-knowing, non-judging Unconscious Energy, and inhabited by Angels. So the first thing “we” (the Ego) have to do, is Surrender. Not give up (though that’ll work too), but give over. I know your reading time is limited, but in Truth or Dare Starhawk does such a fabulous job of describing the difference between Power Over and Power With, that you’ll never regret looking it up. I mean, gosh, it’s only a chapter, and I’m not even asking you to read Who Dies? in this post – though of course you’d be infinitely happier if you did. It is terribly relevant. I dedicate myself to collaborating with the Unconscious in Grace (though I have no idea what that means! ), rapidly, completely, lovingly, and gently. Then just distract yourself with something pleasant, and leave the rest up to Them. Believe me, They’re up to the task! The possibility of real news? I know, some folks say it’s “anti-American Propaganda,” but it can hardly be worse than American Propaganda, let alone the Predatory Capitalist Propaganda that they usually feed us. so we can link directly to her excellent summary of some of the astroelements that this Full Moon brings us but which we haven’t mentioned. 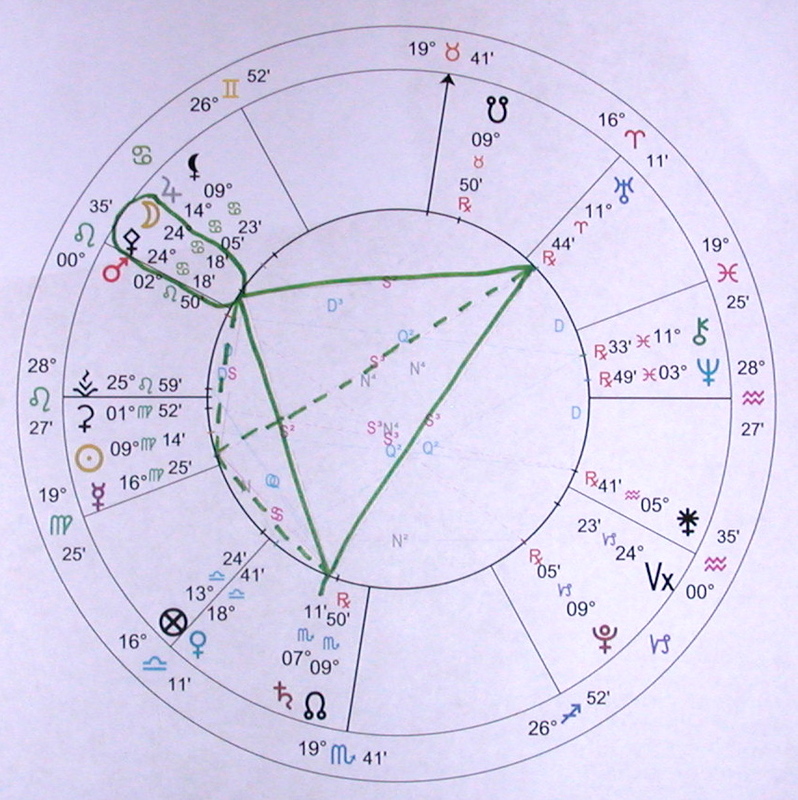 If we use three Degrees of Sensitivity, Juno (Unconscious Identity) is slowly stretching its way out of its T-Square (Mastery through Challenge) to the Nodes (Karma and Mission) over the next week, which should give some degree of “relief” to many, as the pressure to come into Integrity with our True Purpose should lighten up a bit. Of course it’s all gradual and relative, depending partly on your Degree of Sensitivity and what else you have going on at 6-11 degrees of the Fixed Signs (Taurus, Leo, Scorpio, Aquarius). The other side of the Coin is that Juno is moving into a Square with Saturn, as Saturn approaches the North Node. That’ll all start heating up around the end of August, and basically means that we’ll all be Asked to Focus on our Unconscious Identity and how it relates to our Mission and Karma. The Universe usually Asks us to Focus by arranging circumstances where we sabotage ourselves or something dear to us. Other than this, we still enjoy our Five-out-of-Six Grand Sextile, and our Uranus T-Square to Pluto and Jupiter (a Challenge to Transform our Lives through Expanding our Authenticity), though Lilith will be replacing Jupiter in that T-Square by the end of the month (a Challenge to Trust our Instincts on a much deeper level). The Vacancy of the Grand Sextile has moved to 11 of Virgo, “In her baby a mother sees her deep longing for a son answered.” That should make our cultural Gender Confusion adventures more entertaining. But the noteworthy thing about the Full Moon lies in the Fifth and Tenth Harmonics – issues of Learning and Abundance. The Moon itself is tightly Quintile (one fifth of the way ’round the circle) to the South Node, implying that we could be Learning a great deal about our Karma over the next couple of weeks (at least), amplifying the Saturn-Juno-Nodes adventures we mentioned earlier. Since the Full Moon is an Opposition and the Nodes are Opposite one another, this makes a Fifth-Harmonic equivalent of a Mystic Rectangle – two Quintiles on Opposite sides of the Wheel, with Trideciles between their ends. A Tridecile is three tenths of the way round the Zodiac, combining Energies of the Tenth (Abundance) and Third (Love with Wisdom) Harmonics – sounds potentially quite benefic. Of course when we’re dancing with the Unconscious, as the Nodes do for a living, we can always see the Opposite of what we expect to see. Which is great if we’re Awake, because that makes an ideal Learning Experience. In fact, even if we aren’t Awake, that should be enough to Awaken us! If you see any Victims running around (including in the Mirror), it’d be a great Teachable Moment. So a Quintile-Tridecile Mystic Rectangle should have meaning parallel to that of a Sextile-Trine Mystic Rectangle. The latter means phenomenal Grace but you may have to provide the initial innoculant. The former then should mean phenomenal Charity if you’re Awake to the Learning Opportunity. That would be Charity extended by the Universe to us, by us to others, and by others to us. Since it’s the Full Moon and the Nodes on the corners, we could easily expect to see Charity in Elightenment. That Portal should be open widest for a half hour starting at quarter to 7pm PDT August 20, but three Degrees of Sensitivity would open the Gate for about four hours on either side of 7pm PDT. That is, starting right now. An excellent period to spend in Meditation, though since much of our Karmic Drama plays out in interactions with other people, hanging with other people should be interesting as well – just be sure to examine any Judgment, Blame, or Victim issues that arise, as that’s where the meat is likely to reside. The Moon-South Node Quintile also has Venus at its Far Midpoint – that is, a Venus Quintile Yod. Venus is at 6 of Libra, “A person watches their ideals taking concrete form in their inner vision.” More validation, suggesting that our Focus should be on What We Want (North Node/Mission Quintile Sun/Source) and What Prevents Us From Having It (the South Node/Karma Quintile Moon/Manifestor). Notice again that the Manifestor Quintiles the South Node, making it likely that we may be Learning here by realizing how we Manifest what we Don’t want. The Moon also Tridectiles the North Node, giving potential to Manifest oodles of what we Do want, but the Quintile is the stronger Angle. We move from Bummer to Delight by realizing that it’s our own Habits that create the Bummers, noticing how we’re doing it, and PIAVAing that we do it differently from now on. For all of us, the five-planet All-But-The-Vacancy Grand Sextile persists for the rest of August. On August 28 Mercury moves into the Vacancy and completes the Grand Sextile again, while Lilith replaces Jupiter on corner number five. And on August 31 the Moon joins Lilith at corner number five, while the Sun replaces Mercury in what is now the Vacancy. That’ll be quite a Portal into September. Remember that the other four corners are Pluto, Chiron, and both Nodes – what an opportunity to Transform (Pluto) our Karma (the Nodes) through Miracles (Chiron). Ride out the Despair side of Chiron to get to the Miracle side. Yes, there’s a Pluto T-Square with Uranus and Jupiter, so that’ll Challenge us to Expand (Jupiter) our Self-Expression (Uranus), and it won’t be optional (Pluto). If we have a natal planet in the Vacancy of that T-Square, near 10-12 of Libra, that’ll be a boon. On the other hand, if we’re in a position where we feel like we have to suppress any part of our True Self (Uranus) in order to stay safe, that’ll certainly add to our sense of Despair. Yesterday, today (August 17), and tomorrow there’s also a Mjolnir from the Uranus-Pluto Square to a Sun-Ceres Conjunction. A Mjolnir occurs when a third party (here Sun-Ceres) Opposes the Midpoint of a Square between two planets, and it implies a likelihood of Thunderstorms and Lightning. Ceres is what’s Sustainable, and Uranus disrupts what’s no longer in alignment with the Soul’s Journey in the Lifetime, so while it may be scary, you might suddenly be much better off if you go ahead and let Lightning strike any place in your Life where things feel stuck. While Lightning can destroy, it also Illuminates the Darkness. So not fighting Pluto here could mean being open to more Authenticity and Honesty than usual, taking more Risks, and tolerating Change, especially sudden Change, as it isn’t all that easy to know where or when Lightning will strike. As far as riding out the Despair side of Chiron to get to the Miracle side, certainly Authenticity and Honesty will help with that, but not from our usual posture of defending the Ego. Chiron requires Empathy. Stand in front of a Mirror and say to yourself, You poor fool, you’re really discouraged, aren’t you. Now switch sides, and let the person in the Mirror say that to you – You poor fool, you’re really discouraged, aren’t you. Have a compassionate conversation with this person. You’re really discouraged, aren’t you. Why so? Well, uh, because, uh, well, they won’t let me. I don’t know, it’s a voice. Where in your body does it come from? When I try this, I don’t immediately feel better, but pretty soon I notice that my spine is now straight and I’m standing taller. Those people and that voice are probably emanating from deep in Linear Time, considering that the Nodes are involved. It would be a good conversation to have frequently. It probably won’t go any deeper than a few exchanges each time, but the side effects could be profound, especially when combined with Tapping. This Vacancy is in Virgo, and Virgo is the one Sign most abandoned by Western Culture, which holds the Individual Ego as Sacred. Virgo’s job is to break down the Individual Ego, to get it ready for meeting and collaborating with Other. So the Culture bullies Virgo into self-abandonment. That’s a huge hump to surmount before we even get started on our own Karma. A big source of that voice which says we can’t. The sense that there is an outside Energy limiting us is not completely of our own Unconscious making. For instance, in the US, who writes the laws we have to live under? Was the US Constitution meant to protect the People from being abused by government, or protect the government from being controlled by the People? Let’s look at a couple of other Natal-planets-in-the-Vacancy situations. What if you had Juno in the Ninth House filling the 12-Libra Vacancy created by the Uranus-Pluto-Jupiter T-Square? That would be a heck of a pressure on your Unconscious Identity to break out of its Ninth-House Pattern of not taking Responsibility. It’s a lot easier in the Ninth House to just Let Go of outcomes, and work off Stress through exercise or other means, rather than working toward a goal. But Uranus has a rather insistent agenda here, and the Grand Cross releases tons of Stress, creating an opportunity for Life-Changing transformation deep in the Unconscious. And what about Sun in the Twelfth House at 12 Leo completing the incipient Grand Cross made potent by the Juno-Nodes T-Square? We’d likely be feeling a very strong need to get our Life in order – for something. We wouldn’t know what, though we could guess that it might have something to do with World Peace. We can feel the Energies shifting underground. We won’t know where they’re bound until they settle. The Twelfth House is about Grief and Meditation; it would be an excellent time to choose the latter. And Suppose you have a Natal Chiron in the Tenth House filling the Transiting Grand Sextile Vacancy. What would that imply? Chiron in Ten says your role in your Community is to reframe the Community’s Worldview. Here you have the force of History (Pluto) behind you, everyone – including you – being Challenged to find their voice (Uranus), and a growing Awareness of your own Calling (Transiting Chiron Opposite Natal Chiron). While enormously beneficial, it’s a serious Challenge to your Confidence and your Limiting Beliefs. 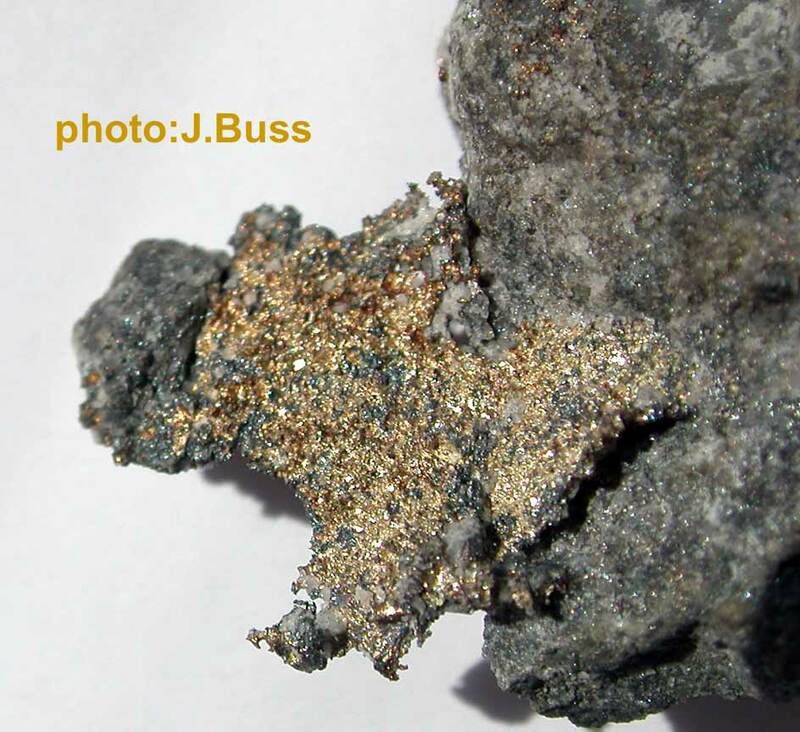 Asbestos isn’t a Mineral per se, it’s a Mineral form, like Sand or “Rock.” A number of different Mineral Crystals can shred into threads and particles fine enough to lodge in the Lungs permanently, hence the danger of Asbestos-form Minerals, like the Magnesioriebeckite in the portrait that introduces the post. Confidence disappears when our Ego-based Sense of Self shreds into fine threads and particles. The Humpty Dumpty story is not a casual tale about Eggs – Egg / Ego, get it? When the Personality shreds, the best advice is to not try to accomplish anything until one puts oneself back together again. Presto, “Hawk’s Eye,” the blue version of Tiger Eye (a little polishing helped out). 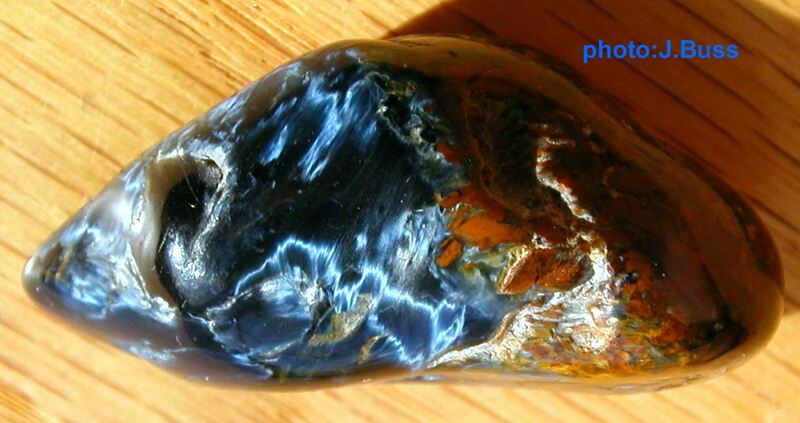 A rock that contains both Hawk’s Eye and Tiger Eye is called Pietersite. It’s “hard as a rock” – no shredding here. While Hawk’s Eye opens the Intuition, Tiger Eye is Grounding, and Grounding is the first requirement for putting Humpty back together again. We’ll talk about why we chose that time in a little while. 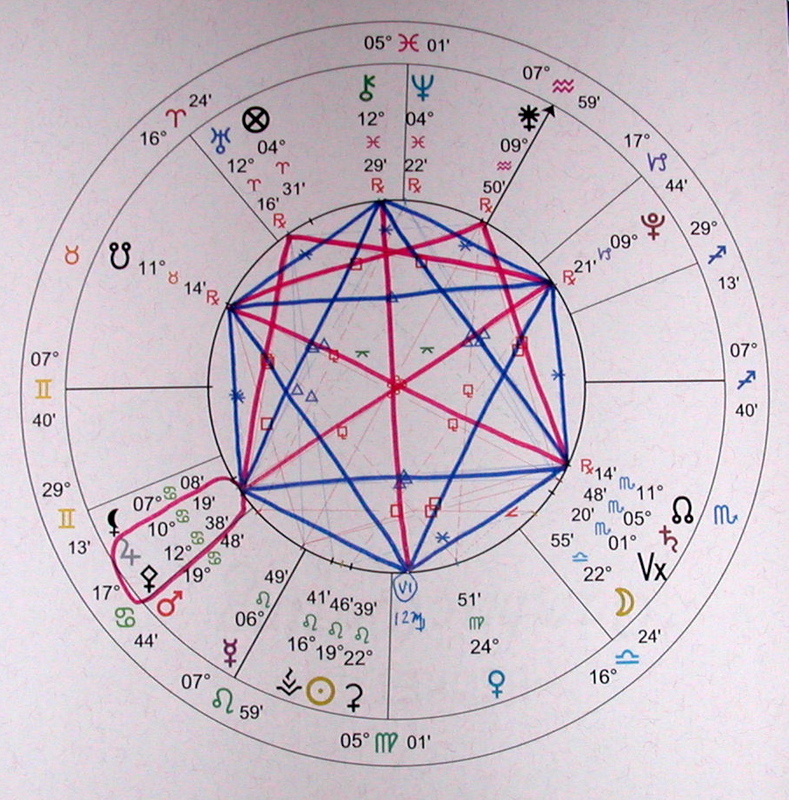 You can see our Kingly Fourth-Harmonic Angles in red, and our Queenly Third-Harmonic Angles in blue, and you can see the hole at the bottom of the chart, where Venus and the Moon have moved on, and are no longer filling the place that completed the Grand Sextile. Bummer, eh? Presto, the Star of David is back! Okay, so just how do we go about supplying the Energy represented by 12 of Virgo? The Symbol for that degree is “After the wedding, the groom snatches the veil away from his bride.” Bingo. What does that mean? Well, okay, we’re talking about not just partnership (Sixth Harmonic) here, we’re talking about ritual confirmation of partnership. The King seems to be Acting abruptly. At least he isn’t prematurely ripping her bodice. But wait, what is he snatching? Her Veil. That which prevents him from seeing her clearly. Not as an object, of course, but as an equal, or better yet as a Guide. The Yang, with his strength and intellect, is great at doing and planning. Doing and planning what? Well, something Valuable, eh? The sense of Value is Yin. Something Creative, or Sustainable? Both Yin. Does it feel better already? It’s not about Boys and Girls. It’s about respect for the Power of the Magnetic, as opposed to the Power of the Dynamic – PIAVA rather than Plan-Do. Of course our ideal is to complete this marriage within ourselves, to balance our Inner Male and Inner Female so our own Yin Energy supplies “the presence of love, connectedness, wisdom and pleasure” while our own Yang Energy presents “support, patience, cooperative strategies and responsibility.” Well, to understand how that’s working we need to look at the Venus-Mars Cycle. The one we’re in Initiated in April at 20 Aries, “A young girl feeding birds in winter.” Birds, since they fly, often symbolize Spirit, and winter a time of low Light or low Vitality. Traditionally, as The Kin of Ata reminds us so well, food is scarce in winter. So we have Spirit nurtured in Scarcity by Yin Energy, and in particular young or Innocent Yin Energy. This Cycle represents a very important time to Clearly see the Feminine. The Angles echo the Symbol, multiplying the significance of the Cycle. Lots of Validation here. We’re left with two T-Squares. By now you know that a T-Square represents Mastery through Challenge. Most of us would just as soon do without too much Challenge. T-Squares are frustrating while we are expecting performance or results. They don’t become interesting till we realize that they’re Learning Opportunities. We didn’t take the lifetime to shine, we took it to Explore. We can have fun Exploring, but Expectations will get in the way. The Uranus T-Square is to Pluto and Pallas-Jupiter. So we’re being Challenged (T-Square) to realign our sense of Self (Uranus) to bring it into Harmony with where the Future is going (Pluto), by Expanding (Jupiter) our Boundaries (Pallas). You know, the old new-wing-on-our-birdcage drama. Confronting our Judgments, in other words. Yang Energy needs to Ascend a bit. Short of a Skyhook, how to do that? Maybe by focusing on “support, patience, cooperative strategies and responsibility“? Support and responsibility for…? Well, what would Lilith do? Focus on Collaboration and Cooperation? Eschew Competition? Neither fight nor flight, but Stand Firm in Truth? Just sayin’. The other T-Square is another we’re familiar with – Juno and the Nodes (to the tune of Bernie & the Jets). It’s about self-sabotage – our Unconscious Identity (Juno) Exploring (T-Square) all the ways to get our Ascension (the Nodes) wrong. Juno wants us to Explore – we just want to get it on because it’s painful trying to live with one foot in each World. How do we complete the Juno T-Square? By taking responsibility to supply the missing Energy of 11 Leo, “Children play on a swing hanging from the branches of a huge Oak tree.” Indestructible Oak was the center of the Grove, the meeting place, the source of Merlin’s Wand and Arthur’s Table. It represents Strength, Sustainability, Solidity, Grounding, and the link between Earth and Sky or Matter and Spirit. And here children swing from her branches. More Innocence. Innocence protected by the Immovable. So these are the three Energies we need to supply, in order to restore the Balance – Clearly see the Feminine, Upgrade the Masculine, and Stand Immovable to Protect Innocence. So, why did we pick this chart? It’s when the Moon (Manifestation, Authenticity) Opposes (Awareness) Eris (Epiphany). The nature of the Sextile is that it symbolizes Creative Grace – it smooths our Path only after we make the first step. As does Pi. She expects us to take responsibility, and to take the initiative. Take the first step. PIAVA What am I not seeing? Pi, would you be willing to loving and gently show me what I need to see and do in order to move out of this place of being stuck? Throw that at your lifelong Limitations, at your lingering dis-ease, at your Fear, at your Scarcity, at your Pain, at your Self-Sabotage, at your Frustration or Grief. The all-but-the-Vacancy Grand Sextile persists into September, with Lilith replacing Pallas-Jupiter at the fifth corner, and with the Sun completing the Grand Sextile for several days at the end of August and beginning of September. The Vacancy will shift a little as the other planets move, but we will be able to use these three Conscious Energies as powerful tools to move Heaven and Earth for the next month or so. The August 12th Moon-Eris Opposition is a brief Portal that gives us an Opportunity to break through our malaise and stuckness to new Insights.